As Gossip Girl episodes go, no one will accuse "While You Weren't Sleeping" of being one of the more boring installments. There was enough going on to make your head spin. All in all, it was a pretty good episode if you can overlook some major plot holes and storytelling that seemed a bit jumbled at times. The best part was Miss Leighton Meester. I'm still on the fence regarding Dair (although inching closer to the YES column), but I'm a card-carrying member of Team Leighton. She's been carrying the show these days. Watching the disheveled, scatterbrained Blair try to keep it together was priceless, funny and sad at the same time. You loved seeing her crash and burn, yet sympathized. That's how a great character should make you feel, and Leighton brings Blair to life with such panache. Her new foil/friend/possible hookup, Penn Badgley, is no slouch either. Last night, we saw the once-unflappable Blair falling apart at the seams, and who was there to pick up the pieces but Dan. Not Chuck, not Nate, not even Serena, But Dan. 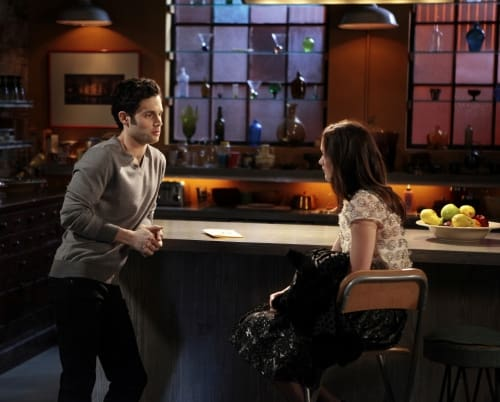 These two are so cute, and the Gossip Girl writers, for all their convoluted and absurd plots, deserve credit for really allowing Dair's relationship to blossom over many weeks. Watching Dan trying to help his non-friend multitask, brushing off her rapid-fire knee-jerk insults and ultimately being there for her was the highlight of the night, bar none. When they ordered pizza together and fell asleep watching movies at the loft, I found myself really happy. I don't know if the fan community at large agrees, but that's me. Chuck and Lily buried the hatchet, duping Russell into thinking they were still feuding. She then flirted with Russell while Chuck broke into the Thorpe's office, and even Rufus got in on the gamesmanship a little bit. Woo! Nate was tasked with keeping Raina busy during Chuck's espionage. Nate enticed her to skip a lunch date with Ivanka Trump with some video games and weed. The return of stoner Nate? Definitely another highlight. On his 18th birthday, Eric was blackmailed into becoming a drug mule for Damien, whose smuggled cocaine was waiting in packages of pink tulips that he somehow couldn't grab himself because of his father's watchful eye. We know, it makes no sense. The short version: various mishaps lead to the wrong stuff getting picked up and Damien crashing Eric’s party wanting $100,000 to pay off his clients or else he'll unveil the secret of Lily’s forged affidavit. Ben is warming up to Lily and so in love with Serena. In the end, Damien was thwarted by one of about 600 holes in the blackmail story - Ben refusing to cooperate. Never mind that it was Serena’s testimony and proving Lily forged anything based on Damien's testimony would be near-impossible. Anyway. The final moments show Damien teaming up with Russell Thorpe (now there's an unlikely, ridiculous alliance) to bring down the Van der Woodsen/Bass/Humphrey alliance. Regarding the love connections, do you see a spark between Serena and Ben? I'm indifferent on that couple. As for Nate and Raina, hey, crazier things have happened right? Watching their impromptu date, I couldn't help but think there was more chemistry there than between Raina and Chuck. Not that the bar was set too high there, but still. What did you think of last night's Gossip Girl, and how do you think things will play out next week? Who are your favorite couples/characters these days? Discuss!